On the eve of the Argentina-Bosnia game, a Brazilian newspaper came up with a cruel statistic. In one World Cup game, Neymar had scored more World Cup goals than Lionel Messi had managed in his entire career. The Brazilian was leading by two to one. The little wizard has now levelled the score, and did it in style in his first ever game in Rio's iconic Maracana stadium. His strike, which turned out to be the winner in Argentina's 2-1 victory over Bosnia, is the moment a packed crowd will guard in their memories of Sunday's game. It was Messi at his best, cutting in with the ball tied to his left foot, exchanging quick passes with Gonzalo Higuain and curling a shot in off the post. Without a slight deflection off a Bosnian defender the ball would probably have gone just wide, but few would complain - apart from Bosnians, and some Brazilians. Most pundits have predicted a Brazil-Argentina final in the Maracana on 13 July - and at times that game almost seemed to have started on Sunday. Argentina fans took over much of the stadium, chanting their songs and creating a memorable atmosphere. "We're the home side once more," they sang. Brazilians, when they were not cheering for Bosnia, taunted their neighbours by reminding them of the all-time score. "Pentacampeao" they sang - we are five times world champions. Argentina trail them by three. If they are going to close that gap they will have to play much better than their shambolic first half. Coach Alejandro Sabella, once a midfield playmaker with Leeds and Sheffield United, seemed to suffer a crisis of confidence in his selection policy. In qualification he at last found a way to get the best out of Messi. 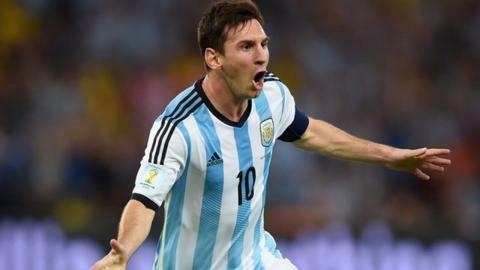 Argentina played a 4-3-3 system, with Messi operating behind Sergio Aguero and Gonzalo Higuain. Some talked of the 'magic quartet,' because the midfield trio included Angel Di Maria. The four of them together, breaking at exhilarating pace, played some fine stuff in the qualifying campaign, and the system seemed to suit Messi. The presence of two top strikers in front of him stretched the opposing defence and opened up space for Messi to work his magic. It is true, though, that the team consistently looked vulnerable at the back - both because Argentina's current crop of defenders are not the best (and goalkeeper Sergio Romero has been a reserve at Monaco all season) and as an inevitable consequence of selecting so many attack-minded players. Sabella was troubled by this, but appeared happy to run the risk. If the game was open, he argued, then he was willing to take the chance that his team, packed to the brim with talent, would outscore the opposition. And then he arrived at the World Cup and seemed to change his mind. Argentina lined up against Bosnia with three centre backs and only Aguero ahead of Messi. And though they were soon ahead, courtesy of an early own goal, it was apparent that all was not well with the side. The first five or six times that Messi received the ball, he went for a run and was dispossessed. He had no options around him to give a pass, and Bosnia were able to get enough players around him to snuff out any danger. Argentina were a goal up at half time, but were extremely flattered by their lead. It had been a shambolic 45 minutes from a team with apparently little idea of what it was supposed to be doing. One of his centre backs came off, and on came a second striker in Higuain. Maxi Rodriguez, who had not supplied the expected midfield thrust, gave way to Fernando Gago - who in qualification had functioned as Messi's supply line. Suddenly Argentina looked like a team. True, those defensive vulnerabilities are still there - the space between the full back and centre back, which Bosnia exploited to score their goal, is a frequent worry. But it is surely a price worth paying for a structure that allows Messi to blossom. After the break, with Gago to give him the ball, and both Higuain and Aguero to stretch the opposing defence, the space began to open up - and Messi took advantage of it with that one glorious moment that ensured that Argentina took maximum points from their opening game. He can play better, as can Aguero and Di Maria. And they will surely have to if Argentina are to close that gap with Brazil and win their third world title. But at least Sunday's win over Bosnia has surely made it clear that his team will seek to get the best out of him with a bold 4-3-3 formation.